It amazes me how this book remains so popular after all these years. I see merchandise for it all the time. Well, actually I wrote this review just about the movie. But the book is a fun alongside-read too! 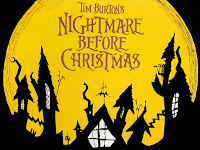 I love love love this film, but I always watch it at Christmas instead of Hallowe'en and it never feels quite right! I should probably try watching it this month and seeing how I like it at non-Christmastime :) Great review!